These families are super wealthy: The average family net worth is $1.1 billion, while the average amount of assets managed by each family office is $808 million. Overall, the families invest 44% of their wealth in traditional publically traded stocks and bonds – with stocks at 28% and bonds at 16%. This is nearly at 60-40 Stock to Bond Allocation in their publically traded portfolio. Public equities are increasingly popular. Their 28% allocation is up 5 percentage points from 2016. 17% of their investment net worth is invested in Real Estate. 21% of their investments are in direct private company investments and private equity funds. points) and external investment management fees (46 basis points). Nearly two-thirds (63%) now have mission statements in place. Only about half of these (32%) are however fully documented. The other 31% have been merely verbalized. The remainder of the family offices are without statements, suggesting that the formalized approach to governance within the private sector is still taking root within the family office community. Investment risk remains a core concern. 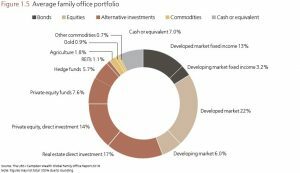 Family offices perceived their most significant risks to be: investment risk at 75%; family data, confidential information and identity theft at 69%; and the protection of the family’s reputation at 49%.